Electric Assisted Vehicle has launched a cargo bike which it says has been “engineered down” from a light commercial vehicle rather than “engineered up” from a bicycle. 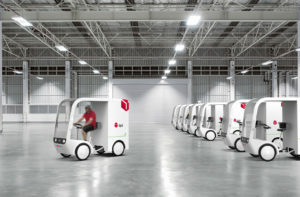 The quadracycle can carry 150 kilos of parcels is peddled and steered like a traditional bike. It has an electric motor that enables the rider to press a thumb switch to accelerate up to 6mph. After that, there is electric assistance to make peddling easier. Adam Barmby, founder and technical director at EAV said: “Part of our business model is to make the P1 a rentable vehicle for the gig economy with an App operation for entrepreneurs so they can use it for their own businesses. We’re also looking at the P1 concept’s ability to carry passengers and we’re keen to work with the Department for Transport and Transport for London to evolve the regulations for this zero emissions solution for future urban mobility”.